I have always thought vermiculite was the most marvelous natural material. Besides, it’s all organic and is a perfect addition to any good potting soil. If you’ve read my books, you know why I don’t like perlite, which most commercial potting soils use because it doesn’t crush in shipping as much as vermiculite does and it is much cheaper. But I’m willing to pay the extra price and I particularly like the coarser size. It comes in fine, medium, and coarse. The only problem with vermiculite is that is very difficult to find in the home gardening market place. Most of the nurseries and big box stores do not carry it and you have to do a lot of phoning ahead (please to not drive all over town looking for it). As you probably know it holds water yet drains when it’s filled, just like a sponge does. The plant roots grow around the particles and take in whatever moisture they need and since the particles of vermiculite take a long time to dry out, moisture is always there for the plant enabling it to grow quicker and more healthy. We are trying very hard to distribute our Mel’s Mix in a bag, hopefully available in all nurseries and big box stores soon. Of course in business soon can mean any number of years. It’s very difficult to get a new product into the big box stores. But we are partially successful now and hopefully on the road to everywhere. For those who still want to mix their own Mel’s Mix, we are looking into having bags of the coarse grade vermiculite available for shipping right to your door. We are making arrangements with several manufacturers located all around the country to do that shipping for us which will cut the cost down considerably. Agway has been a pretty consistent supply of vermiculite in the northeast. Thank you greatly for this information. Can you tell me just a few more details. For example, do you know what they charge for it? Is it a coarse grade and what size bag does it come in? If you have a bag or happen to be in a store soon, can you write down who the manufacturer is and their address if it is listed, so I can get in touch with them? FOR ANYONE LOOKING FOR COARSE VERMICULITE, PLEASE CALL YOUR LOCAL AGWAY STORE listed in the phonebook or google them (http://www.agway.com/store_locator.html). Then hopefully this will get more stores and sale outlets to carry vermiculite so we wouldn’t have so much trouble finding it. If I would like to get started with my garden, what do you suggest as an alternative to the vermiculite? Thank you in advance for your reply. Not a very good alternate. Have you read the book? I explain all the advantages of vermiculite and I relate all the past concerns and I tell you why it is the best to use, especially the coarse grade. You didn’t tell me why you want an alternate, so I can’t really answer your question. I also mention in the book why I don’t like what some people use as an alternate, so please get back to me with your specifics so I can properly answer your question. Thank you for writing. I need help. We’ve used the 1/3 vermiculite, 1/3 compost, and 1/3 peat moss but my garden in not flourishing. What else do you recommend? Should I use a special fertilizer beside Miracle Grow? Sorry to hear that your garden is not doing well. We need to find out some more information in order to help you. Can you tell me the size, price and manufacturer of each of the ingredients that you used. Did you buy your peat moss compressed or loose in a bag? Keep in mind that a bale of 3.9 cu. ft. peat moss is compressed and will expand to almost 7 cu. ft. when opened. It is like when you go to the doctor and tell him “I am eating my veggies and fruit like you told me to, but it is not working…what’s wrong?”. I will also ask a representative from Gro-Wel to contact you to help figure out what might be happening. He will want to know what size boxes you used, did you put weed fabric down or plastic? What plants and seeds did you plant and how they are doing exactly. Also, have you a getting a lot of rain and are your neighbors gardens doing any better? We need a little more description than they are not doing very well. Part of the main reason why your garden did not do that well is most likely because of Miracle-Gro. It kills the beneficial microorganisms in the soil. It is one of the worst fertilizers one could buy. I highly suggest that you check this guy out and watch his videos. http://m.youtube.com/user/growingyourgreens He is like the garden guru. “asbestos free”. Do I need to be concerned? Martin’s Nursery in Greenville, SC has vermiculite in the small bags (8 dry quarts). It is organic but how would I mix that in my 4′ by 4″ garden in proportion to the other ingredients? How much of the dry quarts vermiculite do I need for a square 4′ by 4′ garden plot? I would say that the 4 cu. ft. bag, if it is coarse grade, is your best bet. All vermiculite today is inspected and tested and approved by the government for asbestos free. You didn’t mention what grade it is. I would hope it would be coarse grade. Many of the bags are medium grade, which I would not recommend. Can you also tell me the price they are charging? Most Home Depot have a 2 cu. ft. of medium grade vermiculite for $21 per bag. It’s hard to find the coarse grade, which I recommend. So we here at the SFG Foundation have decided to locate and stock 2 cu. ft. bags of the finest coarse grade I could find and we are going to match Home Depot’s price. If you would wait just a day or so, we are preparing our ordering information on our .com store site. You will be able to order directly from us, sent by post office, parcel post, directly to your door. As soon as the announcement is added to our website, I will copy it and send it directly to you. I would not use the 8 quart size as I’m sure it’s expensive and will not be the coarse grade. That’s usually a fine grade used for seeds starting. Our 2 cu. ft. bags will be shipped out of Columbia, SC, so if you are anywhere close, you can actually pick them up and save the shipping charge. If that is possible, please get back to me ASAP and I will send you the address and pickup information. I hope that gives you a solution to your problem. You are absolutely right, but I do not recommend the medium grade. I’m going to attach right here the letter I just wrote to Bob in Florida explaining how we are going to offer the best coarse grade vermiculite I could find on our SFG store. And the best news is that we are going to match Home Depot’s price, but give a superior product. Your are absolutely right and I missed that one. Home Depot has always carried 4 cu. ft. bags of coarse for $24. That’s what fooled me and without looking closely at this year’s bags, I erroneously assumed, which is a bad thing to do, and especially since they were from the same manufacturer and colored bag as last year, that it was still 4 cu. ft. bags and thinking they reduced the price. Foolish me, the price never goes down does it? But now they’ve almost doubled the price and not even offering the coarse variety, which is more expensive. So we have decided to locate and add to our SFG .com store the very finest, coarse grade 2 cu. ft. bags and we are going to match Home Depot’s price of $20.97 per bag. Even though the coarse grade cost more. I hope that would help you and that you’ll be able to order directly from us. Bob we’re working on the addition for the ordering of the new vermiculite bags to our store and it should be ready in just a day or two. I will save your address and send you a copy as soon as it’s ready if you decide to order directly from the foundation. That way you will have the best and finest coarse grade I could personally find and it will be shipped right to your front door. In addition we are going to offer a $5 credit towards shipping. We will stay in touch. I will send you an announcement in the next day or two, as soon as it’s ready. I hope that solves your situation. If you have already ordered from Home Depot, it’s possible to cancel that order or even return it to your local store, if they allow it. I recently saw Vermiculite in Home Depot! I was very surprised after reading it was very hard to find (and in early planting season, called around everywhere to find it, but did not call Home Depot, assuming they definitely would not have it- ha!). I actually should go snag some, in hopes it is still in stock. I’m a newby at SFGing and planted my first spring crop this year, with no yield. I planted a fall crop today. We will see! There’s a lot of things happening at Home Depot and they have switched from the desired coarse grade vermiculite to the less expensive medium grade, which I do not recommend. To solve this dilemma, we have decided to find and offer the best coarse grade and add it to our SFG .com store. To explain all the details, I’m attaching to this letter a copy of our letters to Willow in VI and Bob in FL that will explain everything you need to know. The last 5 letters we’ve received were all about vermiculite, so we think this is the right step for our company to take. P.S. You mentioned no yield from your first crop. What happened? Please send me details explaining your boxes, soil mix, weed fabric, what plants and seeds and what seemed to go wrong. Maybe we can help. Hi Mel, Have you contacted Micronized Ultratech in Richmond, CA for a West Coast Distributor? They are listed on the gDoc for locating Vermiculite. That’s a good tip and I’ve look them up on the internet and plan to call them later today. Have you done business or dealt with them in anyway…or do you just know about them? It would be great to find a western distributor as that would cut down a lot on shipping cost to our customers. So thank you for the information and tip. 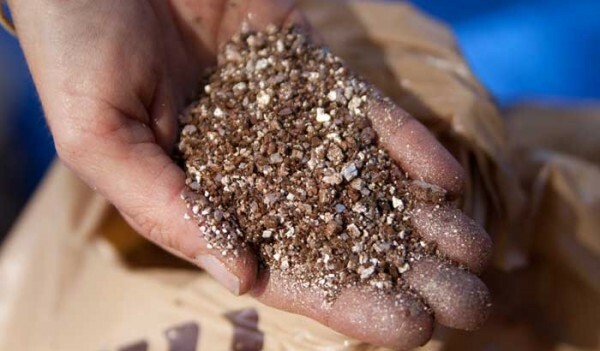 What has been your experience with obtaining and using vermiculite? Did you see pictures of the 2 samples that we showed on my website? Big difference in size of particles. We really like the new source we found in South Carolina, but of course a CA distributor would be even better. I’m beginning to learn that where the ore comes from sometimes makes a big difference and I plan to ask the CA people about that since their ore seems to come from China. Thanks again and good luck with your garden. I had contacted them when I first started my SFG about 4yrs ago and they were very helpful in helping me find their product locally. I had an opportunity to pick some up right at their offices at a significant savings compared to the nurseries, but it wasn’t very convenient for me at the time to drive out to Richmond, CA for just a couple of 4cuft bags. If I recall correctly, they don’t size it as coarse, but small, med, large, and I think I just went for the large. At the time, they were only starting to see the value in horticultural grade vermiculite, so maybe they’re a little more knowledgeable about its use in your mix now. As you probably already know, Thermorock is the brand I see at the big box stores here in northern Cali, but they only sell the medium. Thanks for your reply and the information. I’m going to spend more time on the phone with them and see if we can work anything out. As you have probably read, we have taken on a vermiculite partner in South Carolina. I visited their plant on my last visit there and found it very clean and well organized. So we have started to offer 2 cu ft bags of coarse vermiculite that is absolutely beautiful. We are matching Home Depot’s shelf price even though their bag of vermiculite is medium grade as you know…and a less expensive product. The biggest problem goes right back to shipping…and just that small amount of light weight vermiculite costs from $15-$25 to ship around the country. So we’re thinking of possibly finding a group of our certified instructors that might want to sell from their home and we could then ship an entire pallet, 45 bags, at a much less cost. But that takes some doing and setting up and getting enough people around the country interested. I’ve forgotten if you have told me whether your not if you are a Certified SFG Instructor. If so, which class? If not, how come? You sound like someone we could use to help spread the word and help teach others all the advantages of SFG. Thanks again for your info and I’ll keep you up to date on my progress. Also keep watching my blog for new information to the public. Mel–please let us know what you find out about their possible CA supplier for coarse vermiculite. We are in Idaho and we are getting materials to build a LOT of SFG boxes so they will be ready in the early spring. We need a lot of vermiculite and like everyone else, the shipping makes it ridiculous. I can find the medium grade locally, but coarse grade is only available with shipping. I don’t know if we need enough for a pallet worth yet, but I imagine it would reduce shipping. I’m trying to track down a good source before my husband just decides to go with the local potting soil mix. He’s heard enough good about SFG to be willing to do this but can’t get him to take the time to read the book. I think it’s difficult to convince someone of the superiority of something when they won’t educate themselves as to WHY it is better. For example, he’s started thinking that Diatomaceous Earth pretty much does the same thing as the vermiculite would. I really could use some good info on a bulk course vermiculite source asap. He’s not very patient when he decides to do a project! I need to know how many bags of vermiculite you will need. Every manufacturer I have called for you will not sell to an individual. But if you need at least 1 pallet (30 bags of 4 cu ft), I can get an order placed for you. So step 1 – tell me how many bags you need. Step 2 – we’ll discuss prices, delivery and payment. The price will depend on the amount that you order.